The changes are subtle at first. So subtle you may not even know anything's happening until it's too late. But now there's a solution that prevents Dowager's Hump — and cuts your risk of a serious fracture in HALF! I recently got a frantic call from one of my patients, Marcella. She was in her yoga class when the teacher put her hand on Marcella's back to adjust her posture. To Marcella's horror, the teacher told her: "You know, you've got the start of a Dowager's hump..." Well, when Marcella heard that, she called me nearly in hysterics. She wanted to know if she was going to end up hunched over, her clothes riding up in the back, peeking out at the world from under her eyebrows. Marcella was worried she was already starting to "shrink" like her mother and grandmother. Marcella had many of the common risk factors for bone loss — including genetics. In fact, Marcella told me that when the women in her family would get together they would complain about how much they had "shrunk." Marcella's grandmother, Margaret, suffered from bone loss which triggered micro cracks in her spine, causing it to slowly collapse. By the time Margaret turned 70, she had already shrunk to just 4 feet 10 inches! And her bone loss didn't stop there. As she continued to age, Margaret's bones became even more fragile. Eventually her hip crumbled out from underneath her one night as she got up to go to the bathroom. She died in the hospital a short while later and Marcella was devastated. And her grandmother isn't the only one in her family with bone loss. More than ten years ago, Marcella's mother, Joyce, went to her gynecologist for her annual checkup. And her doctor suggested she get a bone density test to establish a baseline. Joyce's doctor was shocked when her numbers came back. They showed that Joyce's bones had already started to deteriorate! Today at age 73, Joyce has already lost about a half an inch in height due to bone loss. Marcella never noticed any signs of bone loss before she called me. She exercised regularly. She ate healthy. She did yoga to strengthen her muscles. So when her yoga instructor pointed out the small but noticeable "hump" between her shoulder blades, Marcella was shocked. Suddenly, all she could think about was the long line of "shrinking women" in her family. She told me, "Dr. Zand, I've been an idiot. I've never paid real attention to bone loss before. I didn't think it could happen to me..."
So Subtle, You May Not Even Notice It's Happening... That's Why You Need to Take This Action NOW — Before It's Too Late! Unfortunately, Marcella's story is not unique. Despite their best efforts, millions of women suffer from weak bones, which increases their risk of the micro cracks that cause Dowager's hump. These micro cracks are caused when the bones or vertebra in your spine begin to dissolve, becoming weaker and more porous. In people with this type of loss, sometimes simply sneezing or coughing can cause a micro crack in the spine. These cracks can even be caused by a hug from an overly enthusiastic friend or relative. Over time, these micro cracks cause your spine to become misaligned and to curve forward. This puts even more pressure on the rest of your spine, often causing even more cracks. In fact, an estimated 1.5 million Americans suffer from these micro cracks every year. And many of them pay the price with chronic back pain, disability, loss of independence, and Dowager's hump. Not only that, but as these cracks cause your spine to tip forward, it also causes your stomach or abdomen to stick out. Marcella told me that her grandmother used to complain, "I shrank and my stomach had nowhere to go but out!" Depending on where they occur, these micro cracks can also cause a "sway back." Or they can cause your entire spine to slowly collapse causing you to "shrink." The problem is that bone loss is "silent." The only warning sign that something is wrong may be in your height. X-rays show that patients who have these micro cracks in their back often lose as much as 4 cm in height or more. Not only that, but they have a much higher risk of hip fractures too. In fact, over 250,000 Americans over age 65 will break their hip this year alone. And the real tragedy is that the women who break their hip are 5 TIMES more likely to die within a year than those who don't! And that's why bone loss is called a "silent killer." As one leading orthopedic surgeon put it, "You won't feel it early on, but you'll pay for it later. And it's almost totally avoidable." The good news is, this doesn't have to happen to you. That's because I'm going to share with you what I told Marcella. I'm going to tell you about an exciting new bone-building breakthrough that can make your bones 18% thicker... cut your risk of fracture by HALF... and even erase up to 10 years of bone loss! Yet the sad fact is that most doctors still don't know about it! BONE BUILDING BREAKTHROUGH #1 Naturally Occurring Mineral Slashes Your Risk of Micro Cracks and ANY Kind of Bone Fracture in HALF! What is this incredibly powerful yet overlooked bone building breakthrough? It's a natural mineral called strontium. Strontium has been getting a lot of press lately. That's because it not only helps build new bone, but it helps prevent old bones from being broken down. Strontium works by making bone-building cells multiply more quickly while slowing down the action of bone-dissolving cells. It also helps your body to hold onto calcium, phosphorus and protein in your bones — making them stronger. In one study, women who had thinning bones in their spines and necks who took strontium were 52% less likely to experience a compression fracture or any type of fracture. In another study, women who had already experienced slight bone loss in their spines took strontium for three years. At the end of that time period, more than HALF of the women had restored their bone density to NORMAL. They literally reversed their bone loss! In yet another study published in the prestigious New England Journal of Medicine, women with low bone density who had already suffered at least one compression fracture in their spines who took strontium slashed their risk of experiencing another fracture by nearly HALF in just one year. Not only that but they increased their bone density in their backs by 14.4% and in their necks by 8.3% on average. That's the equivalent of restoring 10 or more years of bone loss! Even more research found that women over 80 years old who took strontium slashed their risk of fracture by up to 59% in just one year! That's virtually unheard of! And it's not just women who can benefit from strontium. In still more research, men with low bone density who took strontium had 30% fewer fractures and 80% less height loss, and less back pain. When I saw all the data on strontium, I knew I had to get it to my patients and readers fast! So I called my friends at Advanced Bionutritionals and asked them to create a high quality bone building supplement with strontium. It's called Ultimate Bone Support and it's available to you as part of this special introductory offer. Ultimate Bone Support gives you the most effective amount of strontium to strengthen your bones based on the latest research. It gives it to you in the dosage proven to work in the major studies. And it gives it to you in the form of strontium citrate, a form that is easy for your body to absorb. BONE BUILDER #2 The Little-Known Bone Mass Regulator Found in Beer! As you may know, your body is constantly building up new bone and tearing down old bone. New bone is built by cells in your body called osteoblasts. And old bone is broken down by cells known as osteoclasts. In order to maintain a healthy bone mass and prevent micro cracks, back pain, fractures, and other bone loss symptoms... your body must maintain a delicate balance between the two types of cells. When too much old bone is broken down and not enough new bone is created, you can lose critical bone mass. But here's good news. You can help maintain this critical balance with hops, an ingredient found in beer. 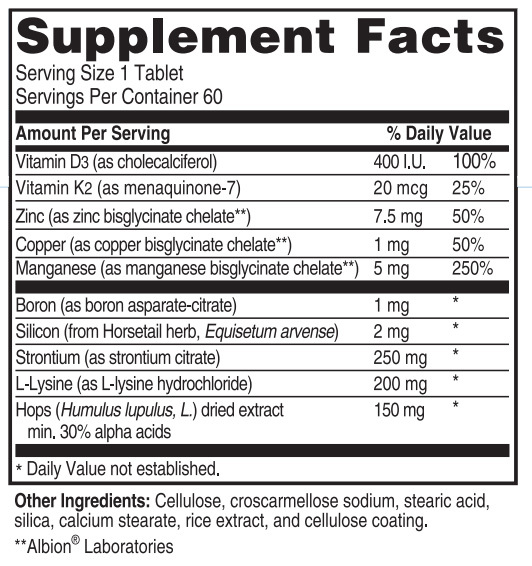 And if you don't like drinking beer, you can still get many of the bone-building benefits by taking hops extract. That's because hops extract contains orthosilicic acid which stimulates your body to make more bone-building osteoblasts. The more orthosilicic acid you have, the more osteoblasts your body has, and the more bone they help build. And hops extract also slows down bone reabsorption so your bone stays thick and strong. If you suffer from everyday muscle aches and pains in your back, don't just assume it's "old age" and ignore it. Muscle aches and bone pain are an often overlooked, yet common sign of a vitamin D deficiency. Vitamin D helps protect your bones and it also helps your body absorb calcium. When your body is deficient in vitamin D, you're at much greater risk for bone loss and serious fractures. In a study published in the Journal of the American Medical Association (JAMA), 50% of women hospitalized for hip fractures were found to have a vitamin D deficiency. The good news is, when you increase your vitamin D levels, you can reduce your risk of fractures. In a large controlled study of elderly French women published in the New England Journal of Medicine, there was a 43% reduction in the number of hip fractures in those treated with 800 IU of vitamin D.
Now, you probably already know that one of the best sources of vitamin D is the sun. The ultraviolet rays in sunlight cause your skin to make vitamin D.
Unfortunately, the amount of vitamin D your body makes can vary greatly depending on the time of day, season, latitude, and color of your skin. And depending on where you live, vitamin D production may decrease or stop completely during the winter. That's why Advanced Bionutritionals made sure to add a full 800 IU of vitamin D3 in each daily amount of Ultimate Bone Support. Vitamin D3 is the natural form of vitamin D your body makes on its own when it's exposed to sunlight. It's also the easiest form for your bones to absorb. It's not enough just to build strong bones, you also have to have strong connections between your bones and tissues. And that's where L-lysine comes in. L-lysine is an essential amino acid and a key building block of protein. More importantly, L-lysine helps connect collagen fibers. By linking together collagen fibers, L-lysine helps create a solid foundation for strong bones and cartilage. But L-lysine doesn't stop there, it also helps build protein, repair tissue and heal injured muscles. Plus, L-lysine makes it easier for your body to absorb calcium from your diet. The only problem is that your body cannot make L-lysine on its own. You have to get it from your food or supplements. That's why I made sure that Ultimate Bone Support contained the research proven dose of L-lysine. Vitamin K is often called "the forgotten vitamin" because so many physicians and patients overlook it. And they miss out on a key step in the bone-building process. You see, your bone-building cells produce a critical protein called osteocalcin which is necessary for building and maintaining your bones. Without it, your bones become weak and bone loss occurs. 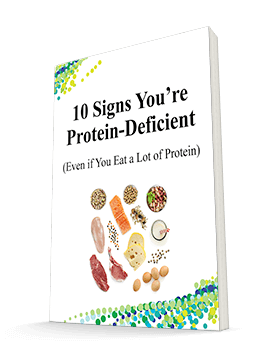 And in order to produce this critical protein, your bone building cells MUST have plenty of vitamin K.
And that's not all. Recent evidence suggests that vitamin K doesn't just help your bone building osteoblasts... it also assists vitamin D. And if you are deficient in one, neither works well in your body. That's why Ultimate Bone Support contains both of these essential vitamins. So that your cells have all the vitamin K2 and vitamin D you need to maintain healthy bone mass. Boron helps your body to absorb BOTH calcium and magnesium and it helps them to get into your bones where these powerful minerals can help strengthen bone. Not only that, but once calcium and magnesium are incorporated into your bones, boron makes sure they stay there! In a clinical study among post-menopausal women who were not undergoing Hormone Replacement Therapy (HRT), boron was shown to significantly slow down the losses of calcium and magnesium. Boron has also been shown to help your body better utilize vitamin D and estrogen. And it helps your body to retain magnesium and calcium — especially after menopause. All of which helps you to preserve the bone you have now! BONE BUILDER #7 The Mineral That Many Women are Deficient in — Due to Popular Advice from their Doctors! Manganese improves your bone structure and helps produce the enzymes your body requires for building new bones. It also helps produce and maintain healthy cartilage and joint fluid — decreasing wear and tear on your bones. But here's the rub: if you take manganese with calcium or iron, they interfere with each other and won't be well absorbed. As a result, many women are deficient in manganese. Zinc plays a pivotal role in the regulation of bone health. Many zinc-related proteins are involved in the regulation of osteoblasts and osteoclasts. Without enough zinc, your bone growth slows down and you need more zinc as you age to maintain strong bones. Zinc has also been shown to promote normal bone growth in teenage girls and in babies before they are born. Plus, a study on men shows it can actually increase bone formation. A moment ago, I mentioned how your body uses L-lysine to connect collagen fibers. Well, in order to build those fibers, your body needs copper. Studies show that increasing copper intake slows bone loss by reducing the breakdown of bone. Not only that, but researchers have found a direct link between copper deficiencies and lower bone density as well as all-important bone strength. Silicon is another essential mineral for bone formation. It's concentrated in your bone and other connective tissue including skin, hair, arteries, and nails. And it helps to increase your bone mineral density and to reduce bone fragility. So you don't have to worry about sneezing and cracking a bone in your back! Get All 10 of These Bone-Building, Bone-Preserving, Bone-Strengthening Nutrients in One Convenient, Supplement! The ten carefully selected nutrients in Ultimate Bone Support act together to improve your bone health. From slowing down bone reabsorption to regulating bone health and stimulating new bone growth, everything you need for better bones is yours when you take this all-inclusive bone-building formula every day. Other ingredients: Cellulose, croscarmellose sodium, stearic acid, silica, calcium stearate, rice extract and cellulose coating. Plus, taking Ultimate Bone Support is much easier than trying to buy all the nutrients you need yourself and spending hours researching which bone nutrients work best together and in which doses. Instead, everything has been done for you! You'll get the exact amounts you need, so you know you are not getting too little or too much of any nutrients. 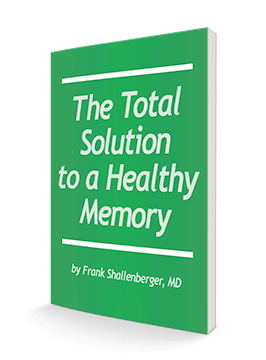 In fact, you could take this formula safely along with your regular supplement regime, because it's designed with multi-supplement use in mind. If you purchased these 10 nutrients separately, my research shows you'd have to spend approximately $150.00 or more for a one-month supply. And you'd have no guarantee you'd get these extracts in the best standardized form possible. But now you can get all 10 ingredients in one formula that costs just pennies a day! Try a 3-month supply of Ultimate Bone Support and pay just $26.65 a bottle. That's $79.95 total plus $6.95 shipping and handling—a $9.90 savings off the regular price. For the Biggest Savings and lowest price per bottle, try our Six-Month Pack! If you want the best deal plus the lowest price per bottle, then go with our Six-Month Pack. Order a six-month supply of Ultimate Bone Support and you pay only $24.95 a bottle. Plus, you don't pay a penny in shipping! You pay only $149.70. That's a total savings of $30.00! Order a 6-month supply of Ultimate Bone Support for just $149.70, plus shipping and handling. And you'll receive two bottles absolutely FREE! This is by far the best value because you save $89.90 off the regular price. Ultimate Bone Support isn't available in stores. There is no other way to get it than to order it here and have it shipped to you through the mail. And that means incurring shipping and handling charges. But I've arranged for you to receive FREE shipping and handling when you request your Ultimate Bone Support within the next 7 days! That's right, you won't pay a single penny. Why have I done this? Because I want to get this powerful formula in your hands as soon as possible so you can start building and maintaining strong bones right away. Consider it my friendly little nudge to get you to act now. I know firsthand how powerful Ultimate Bone Support is and we stand by this amazing product. That's why we're putting our money where our mouth is — with our 100% money back guarantee. You risk nothing. Simply try Ultimate Bone Support and if you don't agree that it's the most comprehensive, easy-to-swallow, bone-building supplement you've ever tried, just send us back the empty bottle within 90 days of your purchase and we'll refund you every penny you paid. No arguments. No hassles. You only pay return shipping. We can't think of a better way to convince you to try this powerful combination of bone-saving nutrients. Together these ten bone-building nutrients give you the maximum support you need to keep your bones strong for life. They stimulate new bone growth and slow down bone loss. They also help increase bone density, help form collagen and connective tissue, and lower your risk of fracture. Studies show these vital nutrients can slash your risk of compression fractures — which lead to back pain and dowager's hump — by more than HALF! Not only that, but they can slash your risk of hip fracture too. Don't become the next bone loss victim! Since there's absolutely no risk to your bank account, why not order today? Just follow the link below, or call us toll-free at 1-800-791-3395. Once we receive your order, we'll rush it to your doorstep. Don't Wait Until You Feel a "Hump" to Get Started! Because Ultimate Bone Support is so effective, you could see a dramatic improvement as soon as your next bone density report. As you strengthen your bones you'll feel more confident exercising and you'll experience dramatic relief from the aches and pains caused by deteriorating bone and cartilage. Not only that, but you'll stand up straighter, your clothes will fit better, and you will look younger because you won't be all hunched over. If you've got the beginnings of a Dowager's hump, this supplement is an absolute must-have. But please, even if you're only concerned about bone loss, don't wait until someone points out YOUR Dowager's hump to you. Give Ultimate Bone Support a try today. It's GUARANTEED to work for you. Yes, I want a worry-free, money-saving way to support my bones. Rush me my Ultimate Bone Support today! Do what Marcella and thousands of others are doing to give their bones the support they need for maximum protection and strengthening. ACT NOW! Order Your Ultimate Bone Support Today!